kmc is completely free of charge for private use. 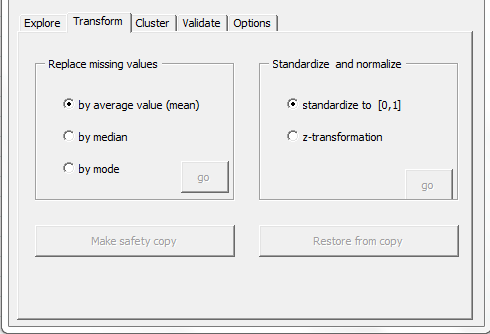 It has been tested with Excel 2010, but the author does not provide any warranty or service. Commentaries are always welcome. 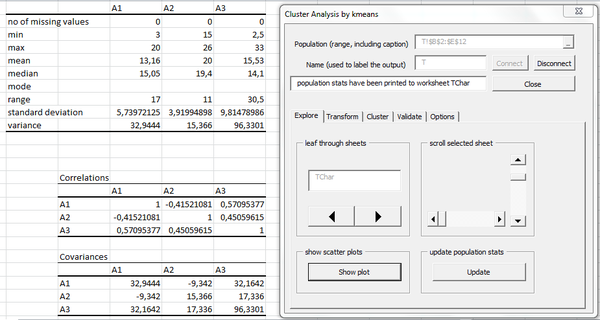 When several runs of the clustering algorithm have been carried out, the user can compare their results by means of a synopsis, showing not only the centers of the clusters, but also the values of the Silhouette index. 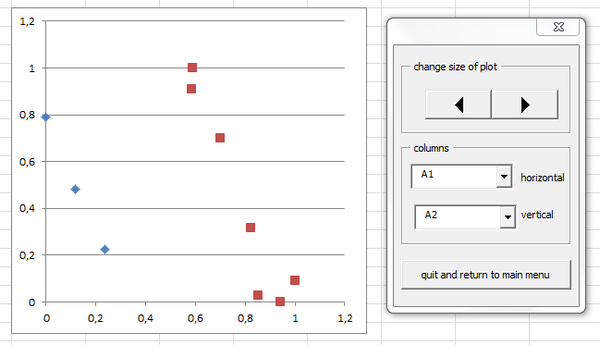 In addition, bivariate scatter plots are available, where the clusters are distinguished by shape and color. The main form contains five sub pages. 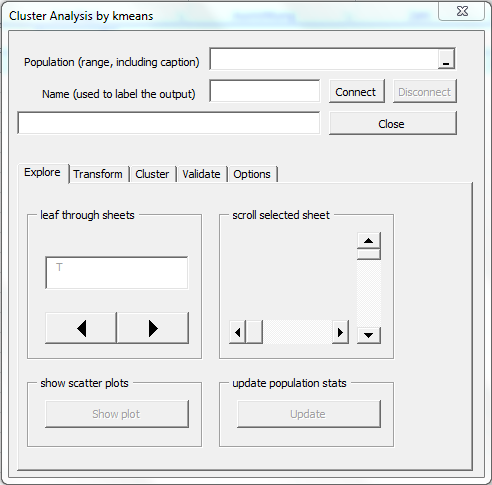 First you must connect to a population (a data set), which is done in the upper part of the form. 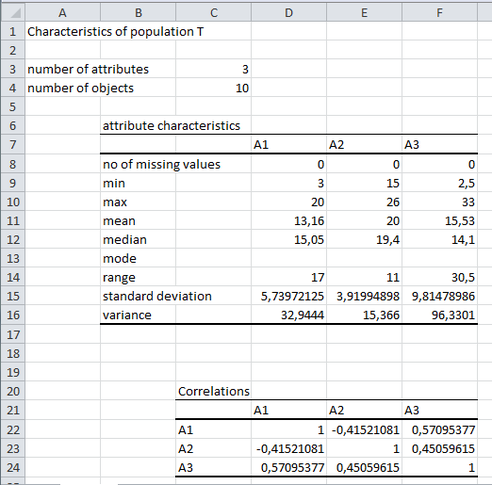 As soon as a connection has been established, essential statistics about the data set are displayed on a worksheet. You don't have to close the form if you want to study the statistics. 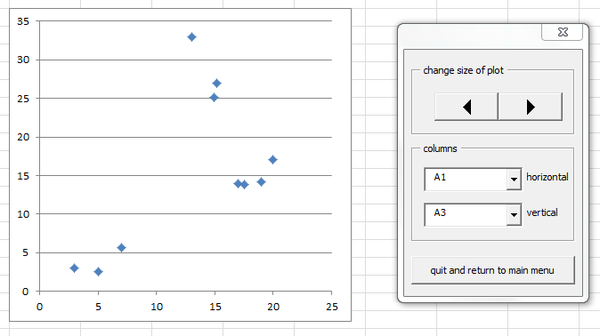 There are controls which let you leave through the worksheets and scroll them. 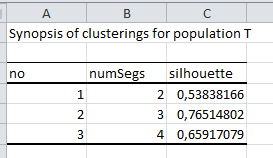 On subpage Cluster you can start the clustering algorithm, after having chosen the number of clusters (segments) and the maximum number of iterations. Unsuitable solutions may be deleted. 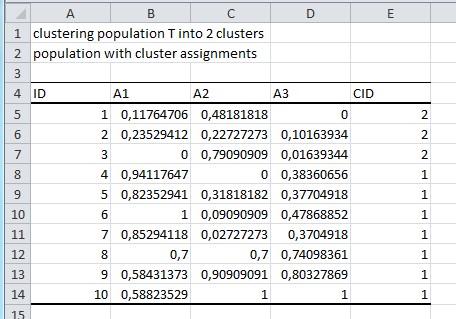 The results of a run of the clustering algorithm are displayed on two worksheets, showing the segments and their members. 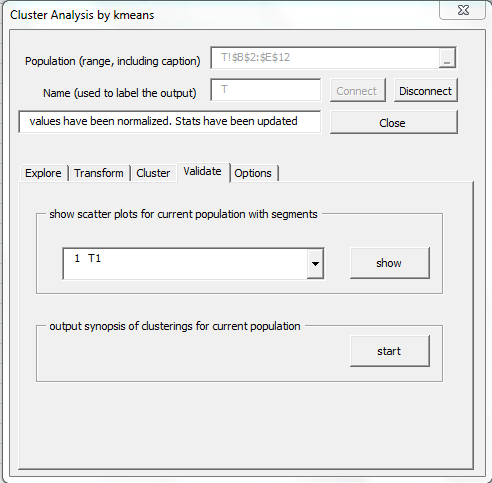 Validation of clustering solutions is supported by means of scatter plots, where the clusters are distinguished by color, and by a tabular synopsis listing all runs for the population and indicating their quality by means of the Silhouette index.